One of the most popular items I sell to clients is digital files. While digital files are wonderful for archiving, they are of course not a tangible piece of art. My hope is that you’ll print your photos so that you can live with them and enjoy them every day, whether you end up ordering your enlargements & wall art through me or printing on your own. 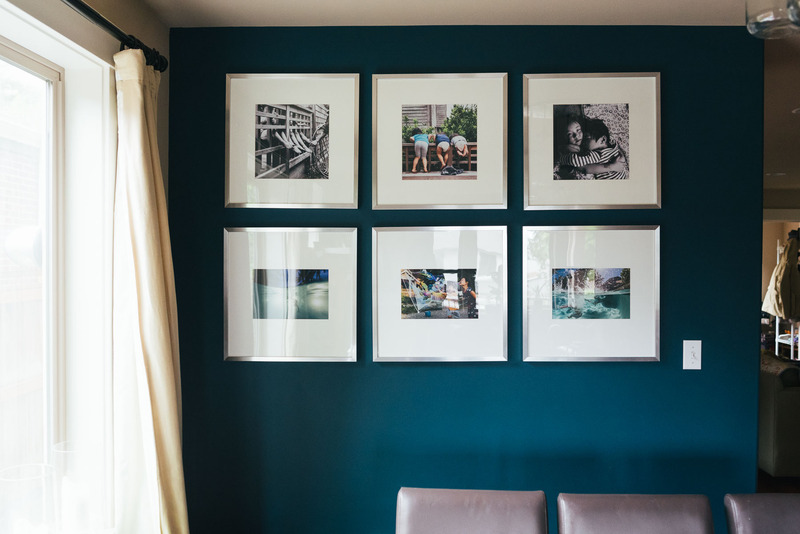 I thought I’d share with you how I’m displaying photos in my own home! 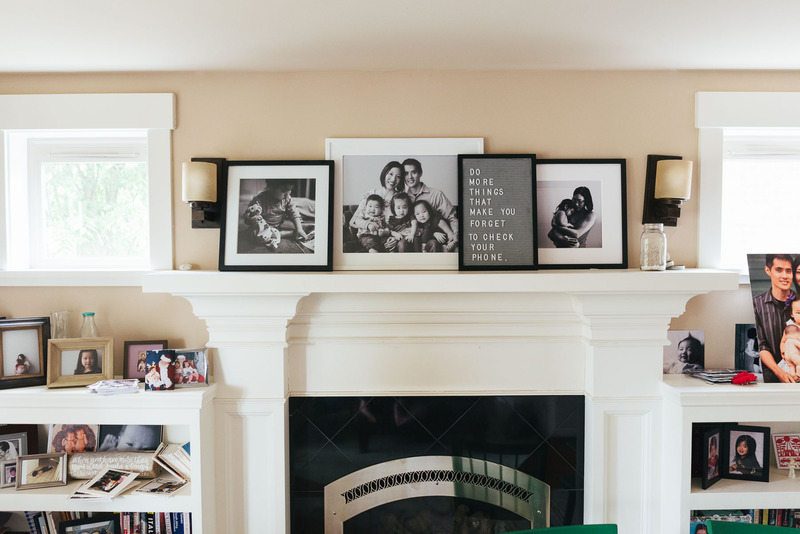 Over the fireplace mantle in our living room, I have a large 16×20″ print framed in the center (family portrait by the lovely Jean Smith), flanked by two smaller prints (those photos by me). The square is a 12×12″ in a square frame with mat, and the one of me and Morgs on the right is an 11×14″ print. I love the classic yet modern look of simple black and white wood frames. These square frames are the Ribba line from IKEA. They come with a mat with a square opening sized to perfectly fit a 12×12″ photograph. Since fitting my photos into a square format is tough for me and I try to maintain the original aspect ratio whenever possible, I had some custom mats cut at Annie’s Art & Frame in Ballard. The bottom row of frames contains these custom mats with 8×12″ openings. I love the large amount of white space around the photographs. Having custom mats cut is an easy and relatively inexpensive way to utilize odd-shaped frames or get exactly what you want if you can’t find a commercially available size. The folks at Annie’s are always so helpful, and will cut mats while you shop or grab a cup of coffee. Here’s another favorite item from IKEA: the Dignitet wire curtain rod which works as a fantastic picture and kids artwork holder. I have actually never seen anyone use it for curtains, but plenty of my friends use it for artwork like we do. You can cut the wire to customize the curtain wire to fit your wall space. We display square prints from Artifact Uprising or Chatbooks on the top wire and reserve the bottom wire for the kids’ masterpieces. These square prints are a great way to get your favorite photos off your device and into your life! 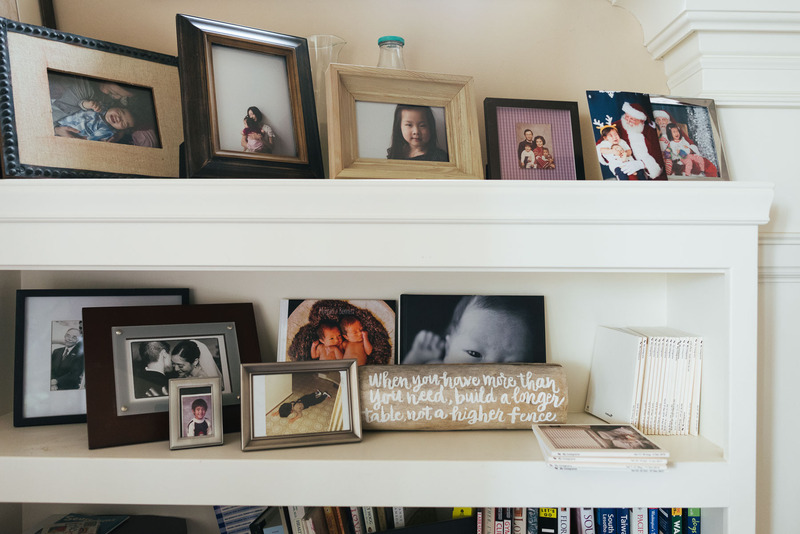 This gallery wall on our stairway was over a year in the making, so trust me when I say I understand decision paralysis and how difficult it is to choose photos to print, frame, and hang from a family photo session. I found the task of selecting favorites from a past documentary family session so exceedingly difficult, which is why most of my clients walk away with a book that I’ve designed and printed for them, leaving no work for them to complete on their end. All that said, I do love this eclectic mix of framed photos, artwork, our wedding invitation (bottom right) inspirational quotes, and even a shadow box containing newborn stuff from the twins. I’ll keep adding to this wall moving up the stairs. My secret to hanging these items was to use 3M Command strips so that I could easily reposition or move any items (though I haven’t needed to). I get lots of questions about that digital drawing of the 3 kids holding the otter pops. It was made from a photograph I took of them by Emmie Bean. She was lovely to work with. Finally I have a few frames filled with smaller prints (5×7″ and smaller) on the built-in bookshelves flanking the fireplace. I’ve mixed in old & new photos. Do you notice the old photo of my husband as a toddler having a tantrum on the floor? That is my most treasured photo of him from his childhood, and perhaps one of the reasons I love making photos of kids having tantrums! The shelf also contains our collection of Chatbooks and a few other photobooks. The kids really love looking through our Chatbooks, which is where I print personal phone photos from my Instagram feed. I’ve had a subscription to their book plan since 2012 and I couldn’t be happier. I blogged about Chatbooks a while back here. Since then they added the square prints service, so you can add 5 square prints to each book shipment. It’s a fun and easy way to get new prints to swap out on our wire curtain line. These photos I have displayed are only a tiny fraction of all of my favorite photos of my family. People have limited wall space in their homes, so I guess my hope is that you’ll have some photos of the people you love printed to enjoy daily, and then you’ll have the majority of them in a more space-friendly yet tangible format which I will write about soon: books & albums! Stay tuned!